When Polaris created the Polaris Ranger they created one of the most unique and multifaceted of all UTVs. Whether you use your Ranger on the farm, on the job, for hunting or for play, we have you covered here at Side By Side Sports. We have tons of parts and accessories for the side by side that can do it all. Are you looking for a Polaris Ranger Windshield? We got you covered. Looking for Polaris Ranger Tires? We got you covered. 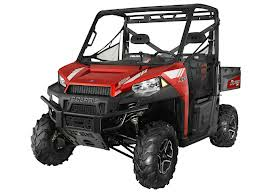 In fact, here at Side By Side Sports we have the largest selection anywhere of Polaris Ranger Wheels, Polaris Ranger Mirrors, Polaris Ranger Enclosures and much much more. Have questions? Call us and talk to any of our knowledgeable staff. They will be happy to help you find the right winch for you machine or let you know which roof will fit with which windshield. We strive to give you the best customer service when shopping for Polaris Ranger parts and accessories.